After having studied piano and chamber music in Paris she went in 2001 to the Guildhall School of Music and Drama with prof. Rudolf Piernay. The more she has been trained by Nelly Miricioiu, Graham Johnson, Malcom Martineau, Ulrich Eisenloch, Martin Katz, Brian Zeger, Margo Garett, Pierre Vallet, Sarah Walker, Jeanine Reiss and Françoise Pollet. In September 2005 she received a scholarship to study opera at the Guildhall School of Music and Drama (GSMD) and sang Gräfin Madeleine (Capriccio), Donna Elvira with the Clonter Opera, Countess Almaviva (Le Nozze di Figaro), Lucia (Hindemith’s The Long Christmas Dinner), Nella (Gianni Schicchi), Alice (Falstaff), Dido (Dido and Aeneas) with Opera by Definition, Susanna (Wolf-Ferrari’s Il Segreto di Susanna) and Mercédès (Carmen). Sophie Angebault is finalist of the prestigious Gold Medal 2007 (London, Barbican Hall), Winner of the Crompton Lied Award and awarded with the 1st Prize of the Thelma King competition in Bath (England) in 2005. She was called Révélation Muses 2004 at the Singing Competition at the Opera House of Nice. In 2016 Sophie Angebault created the title role of Alma Mahler in AMOK, a most successful contemporary opera by François Cattin and Orianne Moretti and sings Brigitte in Geneviève de Brabant in Montpellier. As Mrs Paskova and the Woodpecker in Janacek's Cunning little Vixen she took part in the famous by Robert Carsen directed production of Janacek's "The cunning little Vixen" at National Opera of Strasbourg. The more she participated in an European tour with AMOK and was involved in a series of concerts with works by Vivaldi, under the direction of Giorgio Tabacco upon invitation of the Academia Montis Regalis in Torino, Roma... At home in France she gave several recitals. Due to the immense success of DIVA, Sophie Angebault's season 2018-2019 will be nearly completely occupied by the multiple revivals of that particular attractive show in which she sings larger excerpts from Tosca et Don Giovanni (Donna Elvira). Sophie Angebault has meanwhile appeared as Micaëla (Carmen) in Paris, Annina (La Traviata) in Rennes and Limoges, Brünnhilde in the called production of "Siegfried et l’anneau du Ring" in Besançon and Nancy, La Reine Clémentine (Barbe-Bleue/Offenbach) in Nancy, Nantes, Le Mans, Angers and Rennes, Anezka (Smetana’s Two Widows) in Nantes, Blanche Aline (Les Aventures du roi Pausole) in Genève and Donna Elvira (Don Giovanni) in Corte, Corsica. The more she has sung Gaufrette in the world premiere of René l’Enervé in Paris at the Théâtre du Rond-Point and in Nancy, Baronne de Gondremarck (La Vie Parisienne) in Nantes and Nancy, Die Aufseherin (Elektra) in Montpellier and Wiesbaden, Marianne (Der Rosenkavalier) at Opéra du Rhin Strasbourg, Elena (Mefistofele), Ein Blumenmädchen (Parsifal) in Frankfurt, Dritte Magd (Elektra) in Nice, Mme Lidoine (Dialogues des Carmélites) in Basel and Arabella (here as cover) Frankfurt. Sophie's professional career took off in 2007 when she joined the Les Jeunes Voix du Rhin in Colmar, straightly linked to the Opera House of Strasbourg.There she was cast in roles such as Aufseherin (Elektra), Aloès (Chabrier’s L’Etoile) and Helmwige (Die Walküre). 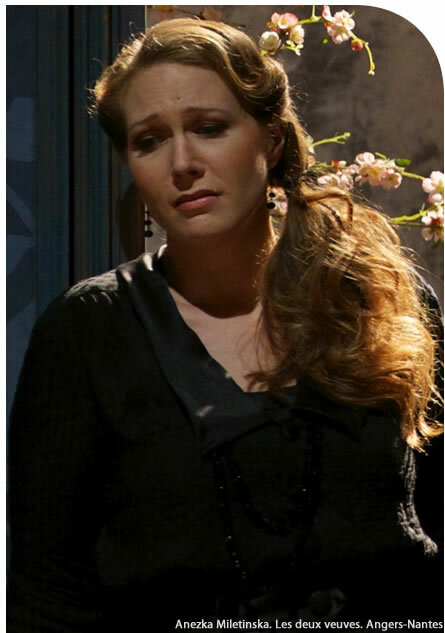 In September 2008 she joined the ensemble at the Frankfurt Oper. Her oratorio repertoire includes the Gloria/Vivaldi, Ein Deutsches Requiem/Brahms, Petite Messe Solennelle and Stabat Mater by Rossini, Harmonie Messe and Theresienmesse by Haydn, Missa Brevis K.V. 194/Mozart, Spirit of England/Elgar, The Armed Man by Jenkins and Beethoven’s 9th Symphony with the Ensemble Orchestral de Paris under the direction of Sean Edwards. Sophie regularly gives recitals in France, Switzerland, Belgium and England (Wigmore Hall). She performed Les Nuits d’Eté, in Paris in 2005, and Shéhérazade in Barbican Hall, London in 2007. In 2006, she took part in the Ravinia Festival in Chicago, under the direction of James Conlon and performed works of Wagner, Schumann and Messiaen. Excerpts from The Long Christmas Dinner, featuring Sophie were transmitted on BBC Radio 3 in October 2006. She took part in the Concert de l’Europe (Sénat), which was recorded by France Musique in May 2008.